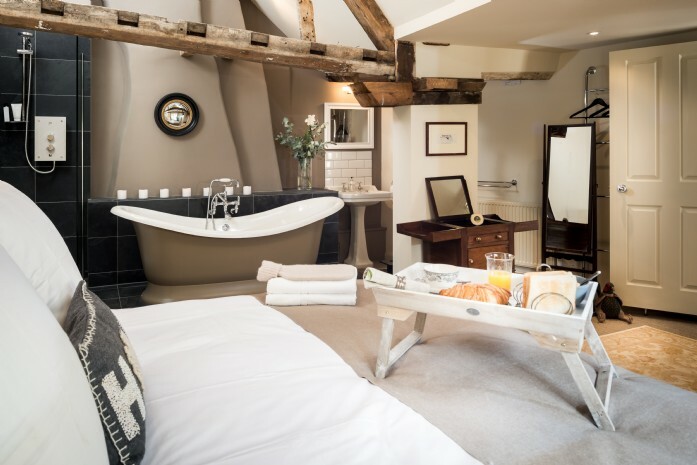 I was thrilled when last January a new client rang and asked me to be involved in renovating beautiful Burdock Fox in Castle Combe. When I first saw Burdock Fox, the builders had moved in and were working on all the structural issues, the walls were down to the original wattle and daub and the whole house was waiting for its facelift! The owner explained that Burdock Fox was to be a “home from home”. 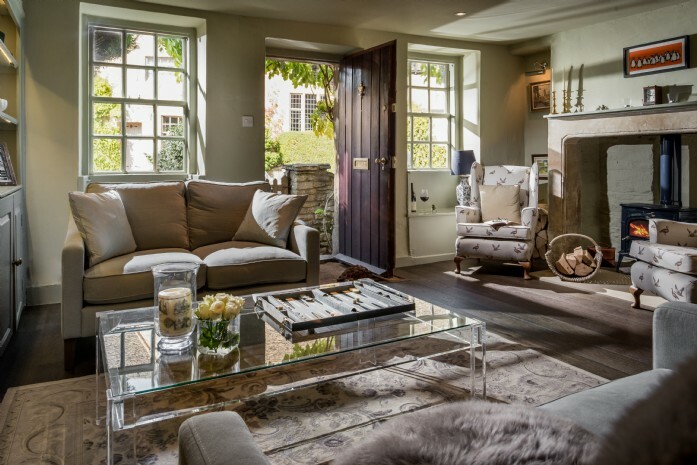 The brief was a contemporary country look, making sure all the beautiful original features shone through but bringing some new interest to the property as well. It was a perfect brief for us and this is exactly the kind of project we love. 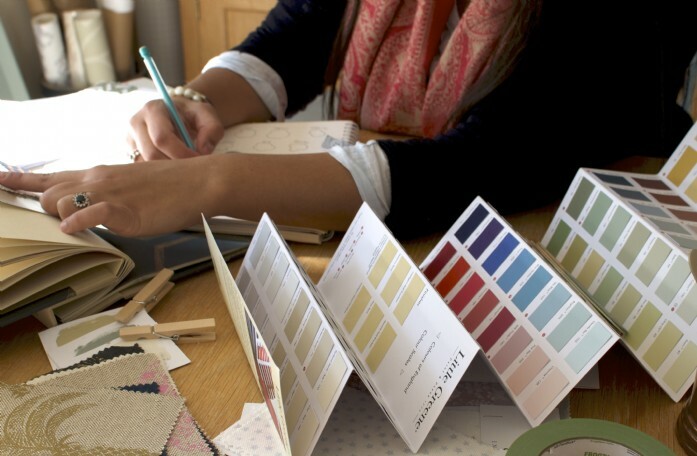 As a starting point our client had identified Emily Bond’s motif linens as something he wanted to incorporate throughout the house. Her quirky animal prints are fun and printed on natural linen they really complement the Cotswold stone. 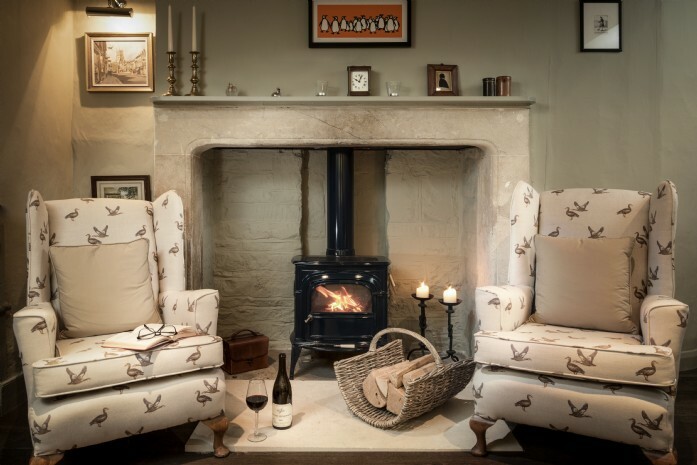 Downstairs there was no need for curtains as there were beautiful working wooden shutters, so instead the Emily Bond Geese linen was used on two wingback chairs to stunning effect; a welcome seat next to the fire after a winter’s walk. The rest of the sitting room was designed to maximise the space and make a bright and cosy area for guests to relax in. The original fireplace is the real star of this room, what a beauty! We stuck with soft natural tones using a base pallet of Farrow & Ball French Grey throughout. This was set off perfectly by the velvet hues in the sofas and the faux reindeer throws. The large Persian rug in soft greys and whites all add warmth to the dark oak flooring. Lighting in period properties is always a challenge, but the room had up-lighters throughout and we also commissioned some bespoke gold-lined, navy silk shades to go on India Jane lamp bases that the owner had already picked for the room. Burdock Fox benefits from an open plan kitchen which means you can both cook and entertain together. We love the copper accents here with the Rocket St George pendants and the modern touches like the Graham & Green silver stag head over the traditional Belfast sink, with marble kitchen tops. 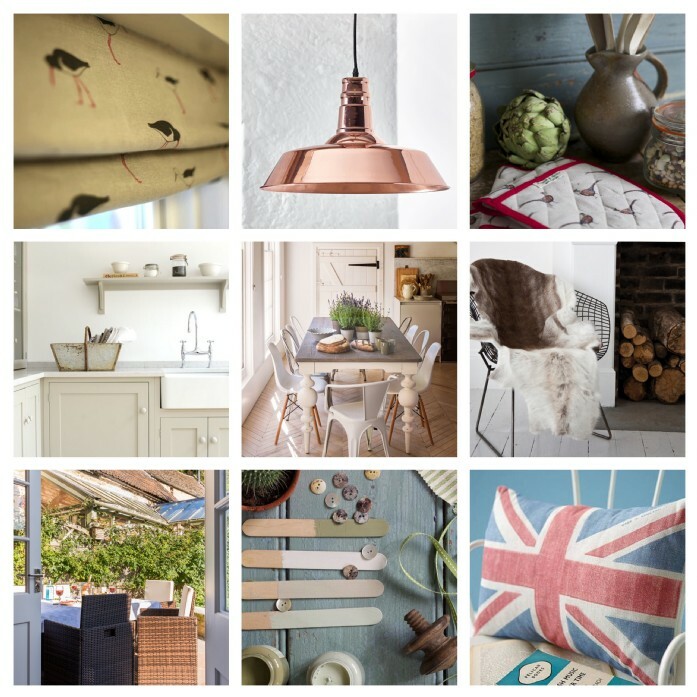 On our mood board below you can see that choosing the right accessories can really make a room. 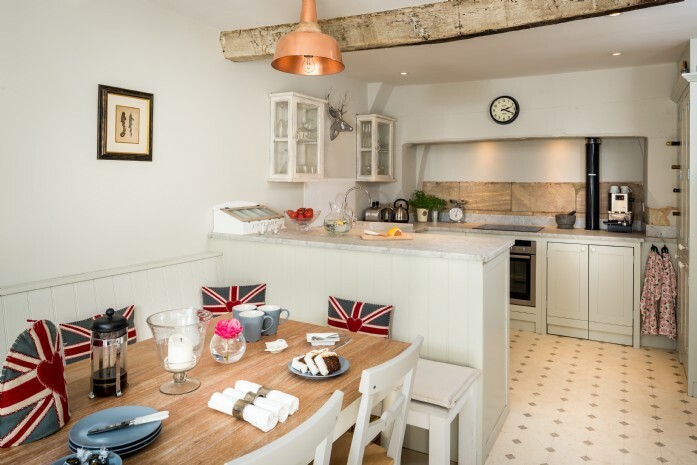 We love the simplicity of the kitchen and didn’t want to distract from the original inglenook which housed the cooker, but some pops of colour and modern pieces really set the look off. Moving upstairs, we again wanted to keep the space light and airy. The walls were all lime white and the stairs are laid with sisal carpet, ideal for the look of the house and slip free (essential for excitable children!). The owner loved the Emily Bond Geese so much; we also used them in the master bedroom. We designed a pair of fully-lined and interlined curtains with a country-style valance, which were hand sewn in our workshop in Herefordshire. 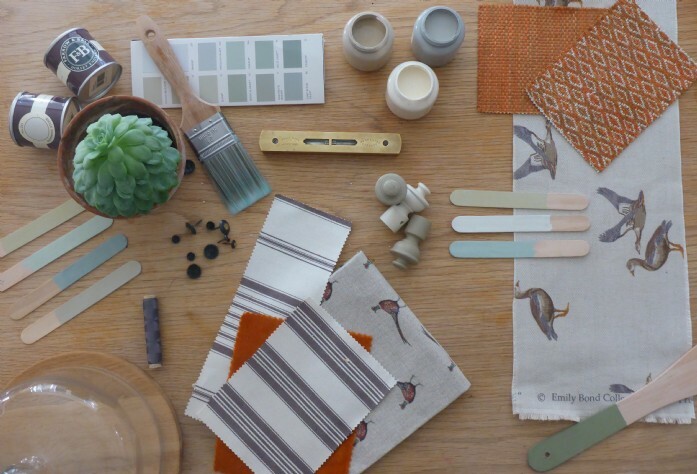 To finish off the look, we made some lovely hand-rolled drum shades with the Geese Linen. The master bedroom is bright and spacious, with a double ceiling height and painted in Farrow & Ball Lime White. The open bathroom and standalone roll top bath is painted in Mouse’s Back. We then matched in the rest of the furniture and accessories (like the hand-painted lamp bases) in Lime White to make sure the room was peaceful and tranquil. 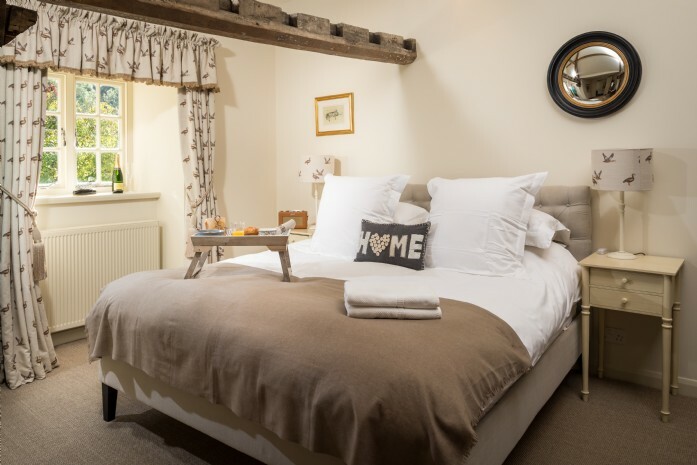 To complete the perfect bedroom the owner added some crisp white Egyptian cotton bed linen – bliss. 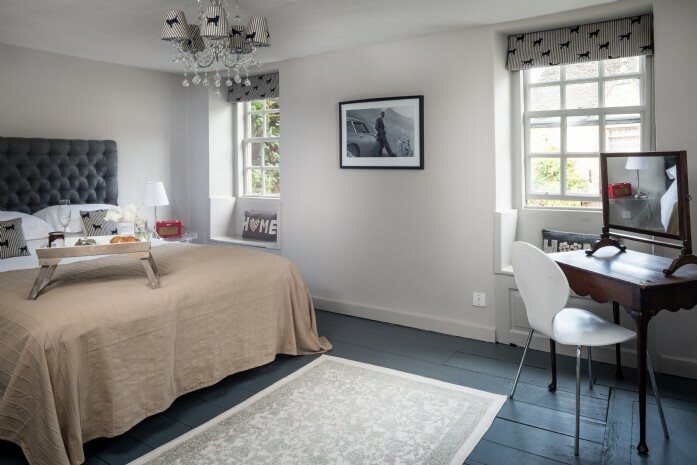 In the second bedroom we used Emily Bond’s Labrador linen for the handmade Roman Blinds and some candle clip lampshades for the beautiful chandelier in the centre of the room. The sanded floorboards were painted in Farrow & Ball Down Pipe. A padded headboard adds that boutique hotel room feel to this room, which is a real treat. It was really fabulous to help on such a special project. I was lucky enough to be involved from the very start, so I saw Burdock Fox rise like a phoenix. A beautiful place to stay and the finished results, I’m sure you’ll agree, all combine to create a very gorgeous country home-from-home.